Thomas Lim believes that keeping seniors active and connected to the community is a good way to stave off loneliness. Sixty-year-old Thomas Lim, who is a cancer survivor, has a soft spot for seniors and believes in keeping seniors as active as positive. As such, he is setting an example in his own life, acting and volunteering, but somehow still managing to advocate for the seniors and putting the spotlight on their issues. You have a strong interest in seniors. Can you share some of the significant things you have done for them so far? I have been a grassroots leader in West Coast Constituency for over 30 years holding various positions such as chairman, vice-chairman, secretary, etc, and I am in a position where I can make some change. In the early 80s, I noticed everyday a group of seniors would be sitting at the HDB void decks. If they went home, what would they do? There would be no activities for them. I then thought of the idea of having a senior citizens corner, where it would also include a pantry and toilets. Being involved in grassroots, I was able to fight to have such a place for the seniors. As a result, there are now many senior citizens corners erected in the West Coast. These corners are near lift landings and they double-up as security guard posts as the seniors can tell if strangers are loitering around. We also recruited some of the seniors as block representatives who then help organise activities/festivities in the blocks for the seniors and their families. I also helped to come up with the idea of an eldercare/day-care for elderly. At the time, I had a mother who was home and had all kinds of health problems like high blood pressure, diabetes, hearing difficulties and at a later stage, she was bedridden. I realised that the elderly may not want to stay at home all the time. Since we have childcare for young children, why not have eldercare for seniors? With the support of MP Dr Wan Soon Bee and the St Luke’s Eldercare, the St Luke’s Eldercare Clementi Centre was opened in 2001 and is still running today. The seniors can come down to the centre on weekdays and are able to interact with other people. During the weekends, the centre is closed so they can bond with their family members. The seniors really look forward to coming to the centre daily for the programmes lined up for them. Seniors don’t like to stay in an old folks’ home, so the next best thing is really an eldercare centre. Caregivers can come down and help take care of other seniors who may not have helpers or even the helpers can take a breather. With the greying population, today there are many eldercare centres run by St Luke’s Eldercare as well as NTUC Eldercare. I feel good whenever I pass by the centres. We have also encouraged nearby schools to get involved with the seniors at the centre so it brings the community together. I find all these projects really touch my heart and I like it when seniors live a better lifestyle. 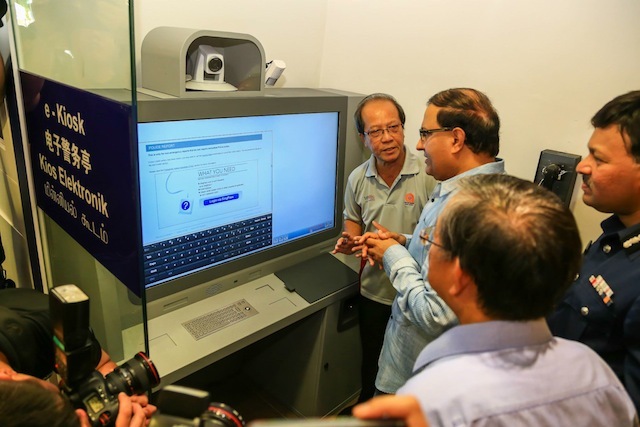 As an e-services ambassador for the West Coast e-Neighbourhood Police Post (NPP), Thomas is showing Minister S Iswaran and VIPs at the opening of the newly revamped NPP. Are you still involved with the grassroots today? In 2000, when the new MP came in, I went low-key and scaled down my grassroots activities. However, the last two years, I have gone back to getting more involved. I am the auditor of the West Coast Active Ageing Committee and a member of the West Coast Citizen Consultative Committee. I refuse to take up any key roles, as I can be vocal and anti-establishment at times! Recently, three Neighbourhood Police Posts re-opened with e-kiosks (where you can lodge a police report, lodge a vehicle repossession report, apply for new passport or lodge a lost & found property report). I objected to the e-kiosk concept and asked the Police, why do this as the seniors won’t be able to handle it. As a result, I am now an e-services ambassador for the e-NPP and am trained to help the seniors on how to use the e-kiosks. I may not be able to turn the “e-tide” so I play a role to help the seniors. If I happen to be around there, I will show them how to use the e-kiosks. You have a real soft spot for seniors. One of my pet peeves is seeing seniors doing nothing at void decks, just wasting their time. If they were sitting at home, they would be bored to death and this would create other problems with family members and later, it could turn into a social problem. Some even throw killer-litters out of the window, just to get attention from their family members. We need to have activities and get them involved. Some of the children don’t want their parents to come down, as they worry it may not be safe for the seniors, so we need to give them assurances. Hence, you wrote the Void Deck script for The Necessary Stage, which will be show during the Fringe Festival in January? 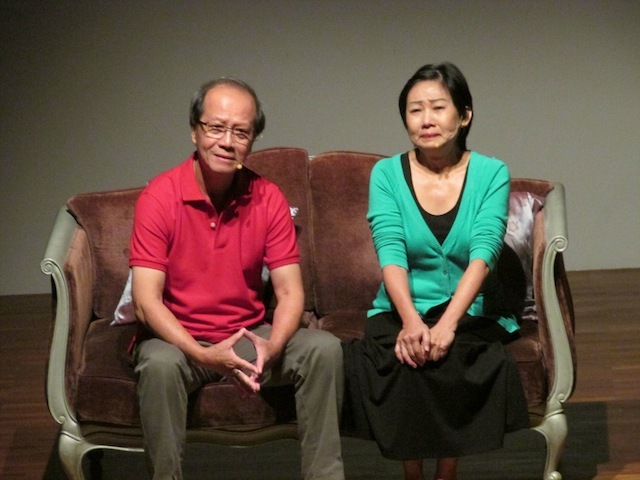 Theatre for Seniors' fourth public performance, Encore IV: The play, "Goodbye". Yes, the story came about many years ago, when some residents noticed an old lady always sitting at a void deck. She would sit there every morning with a flask and food, and then go home every evening. She was not married and used to look after her grandnephew. She was not supposed to talk to anyone. One day, when she fell, it was then that we discovered her situation. She was reluctant to talk at first but only later she revealed the details. She loved her grandnephew and was staying with him and his wife. They both worked and didn’t want her to mess up their place if she was at home, so they sent her downstairs. They warned her that if she caused trouble, she would be sent to an old folks’ home, which she didn’t want. Through my grassroots work, we decided to intervene and the couple was very angry as we warned them to let her be at home or else we would bring the case to the relevant authorities. Several months later, they moved out, so I don’t know if the old lady ended up in a better or worse situation. There are sadly a lot of such issues. When I talk to seniors, I always tell them never take their name out under their home ownership, as this will allow their children to sell the house. Once that is done, the likelihood is the children will kick them out. Any other issues that seniors are facing? The issue of divorce amongst seniors in their 50s and 60s is another issue, which tends to go unnoticed. Society is just pointing fingers. When a third party is involved at a senior’s age, you need to ask why after being together for 30 to 40 years as a couple. More families are facing this issue. I don’t know how to resolve this problem. We need to look at it in-depth and get various agencies involved. For example, when I told the story about “The Other Woman” (another play for forum theatre with The Necessary Stage’s Theatre for Seniors (TFS)), which shares about a man who wants someone to listen to and the wife who has menopause also has her needs, and this results in the man having another woman. Any advice on what the Government should do? I think the Government has already done a fair bit. In Singapore, if you are very poor, the Government will take care of you. However, I think the Government can do a better job of listening to the ground more. There are still cases of MPs and Ministers, only interested in hearing sweet nothings and at times, it is not always good news. They need to listen to people from all walks of life and be open to listening. Most seniors are taken care of, but more can be done to improve the overall well-being of seniors. The Government should not hesitate to try and work through certain projects and then let it go. Do not always expect 100-percent success. Unless you start, you wouldn’t know. So how did your love affair with seniors begin? 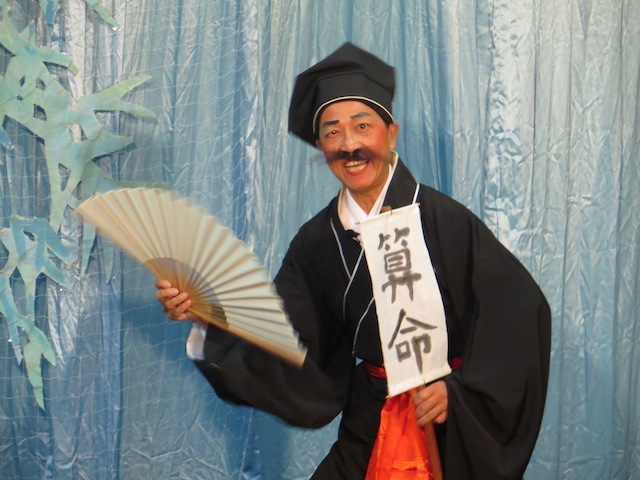 Trying his hand out as a fortune-teller in the Teochew opera. I grew up in a family with two brothers and five sisters. I interacted a lot with the old folks in Mohammed Sultan next to the temple where I lived. My grandfather was a sub-landlord of a shophouse. The hawkers who made chwee kueh, carrot cake, soya bean drinks and beancurd, etc, would rent the “cubicles” from my grandfather and so I got to see people with hardships in the 1960s and many of them were seniors. That is why I have a connection with them. I lived there from birth to the end of 1968. One of them was an old man in his late 60s who was a labourer and who smoked opium. He also was an illegal chap-ji-ki gambling runner. When he worked, he got money. I used to talk to him a lot while he was in the small cubicle and smoking his opium. His story is very sad, after he came to Singapore, he had lost contact with his family in China and there was no way he could go back home. When he got sick, he couldn’t work and couldn’t get money to upkeep his addiction of opium. He left me with a deep impression. There was another old lady also in her 60s, who was a chap-ji-ki runner too but she was very independent. When she saved enough money, she would go back to China for three weeks and would pack a lot of things to give to her relatives. She was the total opposite to the old man. She sewed in the day and collected chap-ji-ki bets for the neighbours. After her days work, at about 8.30pm she would take the bus to Great World Amusement Park to watch movies every night. Her story showed me that you can be active if you want to. So keeping active is something ingrained in you? 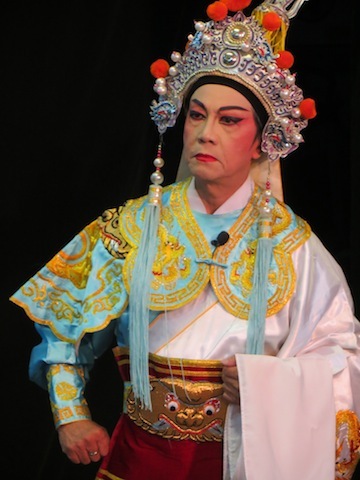 Thomas playing a general in the Teochew opera. Yes. I was active in Teochew opera for two years but stopped in October last year as it became very time-consuming. As an opera student, we learn to sing and will perform to public audiences. Whenever, we have a public performance, we would have many nights of rehearsals, sometimes four to five times a week. It was my childhood dream to have my face painted and to act. It was fun as I got to sing and act as a fortune-teller, general, prime minister, magistrate and boatman. I felt a sense of achievement whenever I received the loudest applause for the evening’s performance. I have also been with The Necessary Stage’s TFS from the start of the three years’ theatre programme in 2008 to 2011. At the moment, I am a member of the TFS Interest Group. In June last year, I performed in a play ‘Goodbye’ for TFS’ “Encore IV”. In the coming Fringe Festival in January, I will be acting in the play “The Other Woman” at the forum theatre by Theatre for Seniors and as one of the facilitators for the other play, “Void Deck”. I also act and work as a freelance simulated/standardised patient (SP) for Tan Tock Seng Hospital, Duke-NUS Graduate Medical School and Lee Kong Chian School Of Medicine. I am trained to realistically portray a patient and I role-play during the training sessions with medical students and medical professionals. I was in the architectural and building glass business for 23 years and chose to retire early in 2006 at the age of 53. After a year, I took up a tourist guide course and am now a STB (Singapore Tourist Board)-licenced freelance tourist guide focusing on heritage tours. The Port of Singapore and The Singapore Story are my specialty. I conduct Economic Defence Tours for our military officers and men. 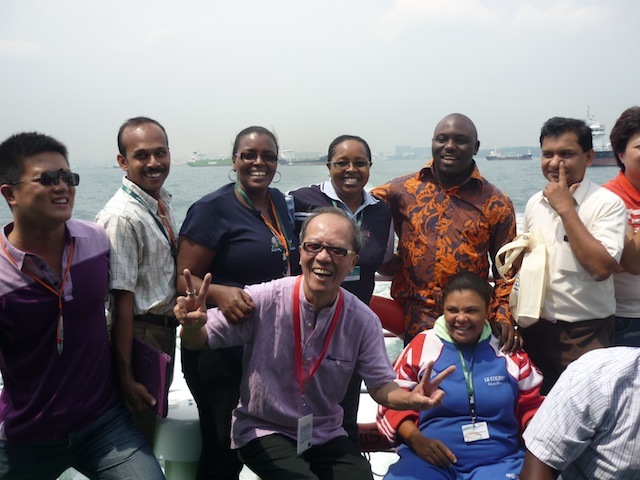 Thomas is a freelance licenced STB tourist guide, where he conducts specialised tours for overseas delegates, individuals and Government agencies. I find a lot of places and buildings being torn down so quickly – how do we tell the story? I am glad places like Little India are left untouched as there is a rich heritage there. Sadly, Chinatown and Kampong Glam are not the same. Under the conservation plan, more than 7,000 buildings and precincts are still kept intact. I am glad that they did this as this will allow me to tell my Singapore Story. We have talked about you helping seniors, can you share a bit about your mother? My mother had all kinds of health problems like high blood pressure, diabetes, hearing difficulties, etc, for many years. If you prolong one’s life and they are not happy, what’s the point in living? I let her eat whatever she wanted in moderation and I even asked her many years before she passed on, what picture she wanted on her funeral hearse when she passed on and what she wanted me to do for her funeral. As a cancer survivor, I am happy to live another day. I told my children if I passed on, I don’t want it to be a sad day, I want them to make it a celebration. Thomas, incidentally, is my youngest brother. I’m indeed proud of his contributions to society and his great achievements so far. Mentioning my late mum, moved me to tears. My mum had worked very hard, together with my dad, to bring us up. Thomas has done the Lim family proud. He is a filial son and a very supportive brother. I’m a senior citizen myself and I’m happy to say that I’m very active like Thomas though I did very little in volunteer work. Keep it up, Thomas! Let’s continue to be active and stay young at heart too! Thomas is indeed a good example for seniors to keep themselves active and happy!!! There’s nothing more that I can express but just to tell you, BROTHER, YOU ARE SIMPLY AWESOME AND I LOVE YOU! It’s obvious that actively participating activities in the society enriches your life and helps the others. The sharing of one’s experiences is equally important since it inspires, echoes what other seniors are thinking and doing. This beautiful group of silver age people needs to share more and to develop furthest because we know we are potential in many ways. Hope to contact me to get connected. Thank you.